Lutz: Sold $130,989 worth of GM stock. DETROIT (Reuters) -- General Motors stock plunged to a 76-year low today, a day after a group of its executives disclosed they had sold shares in the struggling automaker. 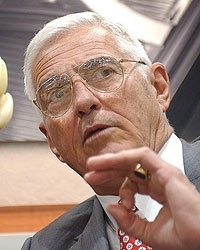 Six GM executives, led by former GM Vice Chairman and product chief Bob Lutz, disclosed on Monday that they sold almost $315,000 in stock and liquidated their remaining direct holdings. The stock sale underscores the pressure on GM with less than three weeks remaining for it to win deals to slash debt and operating costs with the UAW and bondholders to avoid bankruptcy. The other executives who also sold their GM holdings: Lutz's successor, Thomas Stephens; GM North America President Troy Clarke; Chief Information Officer Ralph Szygenda; manufacturing chief Gary Cowger and head of European operations Carl-Peter Forster. GM is headed for either a bankruptcy filing or an out-of- court restructuring that would wipe out current stockholders by flooding the market with new shares to pay off creditors. "Given that there is a two-week deadline, coming there should be additional downside pressure," he said. GM's market capitalization as of today was about $690 million, making it one of the smaller Dow members. The company has lost $88 billion since 2004, including a $6 billion lost for the first quarter of this year. The automaker's shares fell 19.4 percent, or 28 cents, to $1.16 at 3:59 p.m. on the New York Stock Exchange. The stock had fallen to as low as $1.09 earlier in the day, the lowest since 1933. GM was first listed on the Dow in 1915. It was removed before being added it again in 1925, and it has remained ever since. Only U.S. conglomerate General Electric Co, which joined in 1907, has been there longer.